WTB15. Collection of the artist. 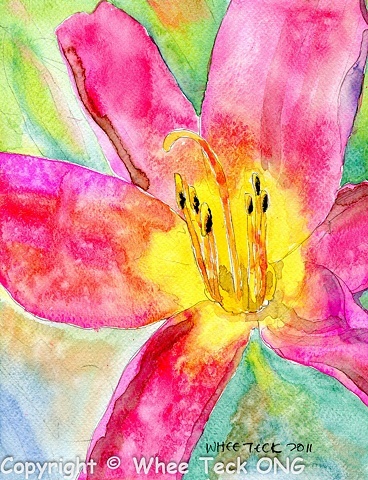 A simple Pink Lily - sometimes the simplest subject matter are the hardest. This is one of Whee Teck's earliest flower watercolor. The simple Red / Green complements with a dab of yellow. The design concept of Mostly, Some and a Bit are used here, i.e. Mostly Pink, Some Green and a Bit of Yellow.